Stress is abundant and life's daily demands often exceed the body's ability to maintain healthy neurotransmitter balance. 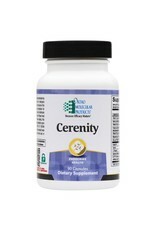 Cerenity supports a state of calmness and relaxation when life brings about anxiety inducing experiences*. Cerenity provides key co-factors and precursors which support healthy levels of the neurotransmitters serotonin and GABA in the brain and Improves stress perception, rebuilding neurotransmitter reserves, and promoting long-term neurotransmitter balance*. 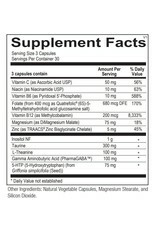 Suggested dosing: 3 capsules, taken 1-3 times per day, or as recommended by your healthcare professional. Does Not Contain: Wheat, gluten, soy, animal or dairy products, fish, shellfish, peanuts, tree nuts, egg, artificial colors, artificial sweeteners, or preservatives. Cautions: If you are pregnant, nursing, or taking any medications for depression or anxiety, consult your health care provider before taking this product. L-theanine is an amino acid found abundantly in green tea. L-theanine has been shown to quickly improve stress perception and resilience. The stress-buffering mechanisms of L-theanine have been connected to its ability to increase serotonin and dopamine production in the brain. L-theanine has also been shown to significantly increase alpha brain wave activity, which is critical for increasing attention as well as promoting a sense of relaxation. In a study on healthy volunteers, electroencephalograph (EEG) readings of participants were recorded following the ingestion of 50 mg of L-theanine. The researchers found a greater increase in alpha brain wave activity versus placebo. L-theanine has also been shown to have a protective effect on nerve cells that are overstimulated by the excitatory neurotransmitter, glutamate. Gamma-amino butyric acid (GABA) is one of the major inhibitory neurotransmitters in the brain. GABA provides a calming effect and is a primary component of the body’s stress fighting mechanisms. Most commercially available forms of GABA utilize synthetically-produced GABA, manufactured from pyrrolidinone, a compound not allowed for use in Japan. Cerenity includes a patented, naturally-sourced, non-synthetic form of GABA called PharmaGABA®. It is produced naturally by the friendly bacteria, Lactobacillus hilgardii. In contrast to synthetic GABA sources, PharmaGABA® has been shown in published research studies to promote relaxation effects in the central nervous system (CNS). Alpha brain waves are associated with relaxed and effortless focus, while beta waves are associated with stress, restlessness and scattered thoughts. Therefore, an increase in alpha to beta waves is associated with improved concentration, and a state of centered relaxation. Inositol is a B vitamin that is an important component of cell membrane signaling. As part of the cellular signaling system of the CNS, inositol is crucial for the release of neurotransmitters from within the nerve cells. A deficiency of inositol can affect brain signaling, resulting in inadequate neurotransmitter release causing irritability, worry, and restlessness. 5-Hydroxytryptophan (5-HTP) is an amino acid intermediate that is directly converted into the mood-regulating neurotransmitter, serotonin. Maintaining a healthy serotonin level is important for supporting a sense of calmness and relaxation, regulating appetite and the sleep cycle. As a dietary supplement, 5-HTP is produced naturally from the seeds of the African plant, Griffonia simplifolia. In contrast to l-tryptophan, 5-HTP provides efficient conversion into serotonin because it does not first need to be converted by tryptophan hydroxylase. 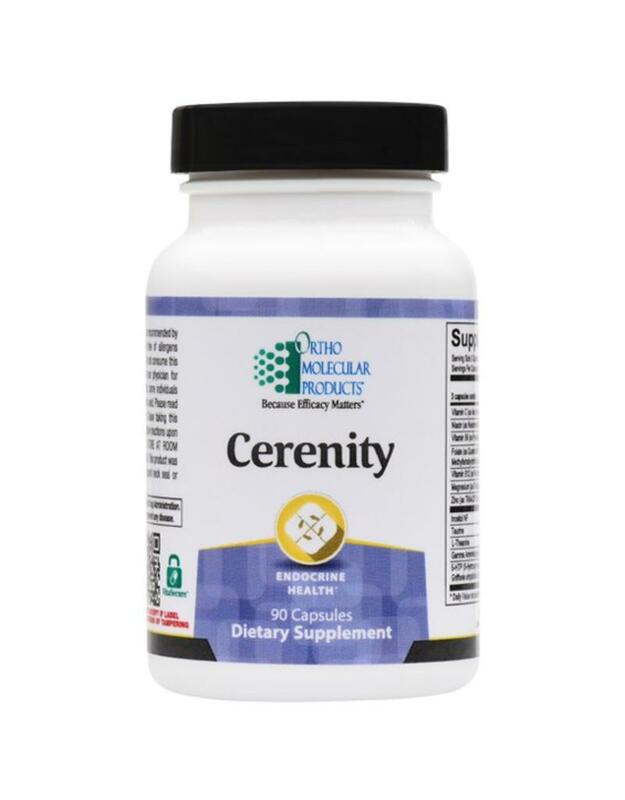 Cerenity includes essential nutrients that are required for the synthesis of serotonin and GABA neurotransmitters. 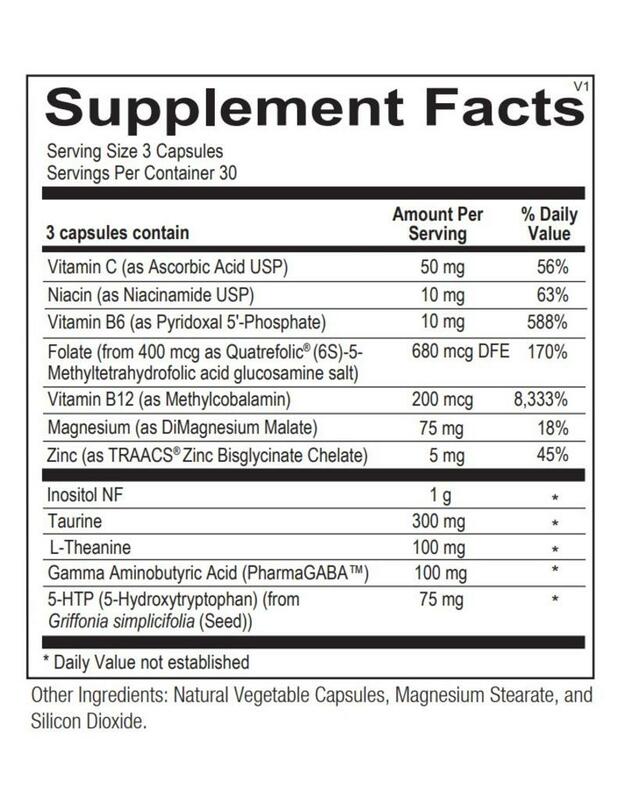 This includes 5-methyltetrahydrofolate (5-MTHF), vitamin B6 (P-5-P), vitamin C, zinc and magnesium. 5-MTHF is the biologically active form of the B vitamin folic acid which is vital for supporting proper mood regulation. 5-MTHF works together with B12 as a methyl group donor. Methyl (CH3) group donation is important for maintaining neurotransmitter synthesis. Magnesium is a mineral that calms the nervous system by binding to glutamate receptors, which reduces excitatory neurotransmitter activity. The combination of the minerals zinc and magnesium helps reduce glutamate to non-toxic levels, providing significant neuroprotection.